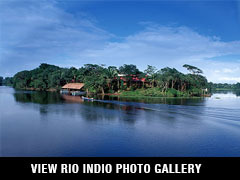 Rio Indio Lodge sits just inland on the east coast of Nicaragua, located in the middle of the jungle. Offshore, inshore and back country fishing come together here in a phenomenal way. Amenities include open bar, elegant restaurant and a wildlife observation deck overlooking tropical gardens. Non-anglers can also explore the surrounding jungle areas for eco trips upon request or simply lay out by the beautiful pool. This is one beautiful place! The location of the Rio Indio Lodge in this region of Costa Rica and Nicaragua puts us in the ideal position to fully explore its great sport fishing potential. Tackle-tearing Tarpon, Trophy Common Snook, Fat Snook, Rainbow Bass (Guapote), Mojarra, Drum and many more make us an exclusive year-round fishing destination for species unlikely to be found anywhere else. For our Caribbean coast operation, we utilize our fully outfitted 16-foot Jon boats allowing anglers to work the rivers and back waters, while our powerful 20-foot fishing vessel allow us safely fish in shore and along the river mouths for Tarpon, Jack, Triple Tail, Snapper and Tuna. Our bilingual guides (most being Rama Indians), know the area like no others and are experts on the latest fishing gear, knots and techniques. Our guides will take you to exclusive virgin areas of the rain forest that only our boats have access to, discovering a whole new concept of unexplored and unexploited sport fishing. No matter how you like your fish cooked it is always nice to catch it with a happy face. Once all of the fish are in the boat, we will steam you back to the lodge to have our expert chef cook them for your lunch or dinner. We arrange all the pampering you need to ensure your visit with us is not the one that got away. Bring the family for a vacation they will always remember. There’s something to do for everyone! Miami, Ft. Lauderdale, Orlando, Houston and Atlanta are common U.S. gateways to San Jose, Costa Rica. Airfare to San Jose typically runs approximately $450 from a gateway city, depending on your location. Our travel agency can help with your flight arrangements. Note: airfares may change until final booking. Any changes are subject to the airlines rules and baggage restrictions. Airfare to San Jose, airport departure taxes, meals at the hotel in San Jose, gratuities, gifts, items of a personal nature and top shelf liquor. Lodge's open season is year round. Prime time is between September through May. You fly to San Jose, the capital city of Costa Rica, where you will be met and transported to a San Jose hotel for overnight. Early the following morning, you will be transferred to the airport for a flight to Nicaragua Early international arrivals may be able to make same-day connections to the lodge. 20 guests at lodge. 12 anglers per week. You'll stay at Rio Indio Lodge, a first-class resort in the middle of the Nicaragua jungle. The rooms are spacious, with two queen-sized beds and a private deck. Other amenities include swimming pool and nice restaurant. This is the perfect place for the whole family! Breakfast and dinner are served at the lodge. Lunch is provided aboard the fishing boats or you may return for lunch and perhaps a siesta break. Day 2: Early morning flight to Nicaragua. Transfer to lodge and after breakfast start fishing time permitting Overnight at lodge. Temperatures typically range from 80 to 95 degrees. Information in Trip Details is subject to change without notice. Worldwide Sport Fishing, Inc. is not responsible for any unintentional omissions, or erroneous information which may be provided by the local operator. See our general Terms and Conditions statement. Information contained within this website is copyrighted by Worldwide Sport Fishing, Inc and unauthorized use of photographs, graphics or text is prohibited by law.